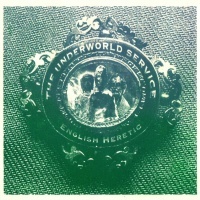 The Underworld Service is the latest CD with accompanying publication from English Heretic. Headed by Andy Sharp, an occult explorer who is adept at finding and exhuming links between horror films, esoteric text and the landscape - which in The Underworld Service descends into Tartarus; dwelling on the central theme of katabasis, with its twin meanings of dreams descending into the underworld and also as a journey from land to the sea. Informed by the writings of the American archetypal psychologist James Hillman, The Underworld Service acts as an intimation on mortality, broadcast as a radio program, with a playlist of tracks woven, like previous English Heretic releases, with film samples, documentary voice-overs, and field recordings from their own Suffolk based location and other sites of occult significance. Against a backdrop of alchemy and nuclear psychology, on The Underworld Service English Heretic sail into uncharted territory, taking on board with them alchemists, occult psychogeographers, self-destructive alcoholic writers, Situationists, zombies, US soldiers in combat in Vietnam and other souls as they voyage on a nightly descent to Hades. The Underworld Service opens with 'Inside The Mausoleum', its ghost like hum slipping into a sample and violin soaked sound underpinned by rhythmic bass touches with Richard Burton's documentary narration, reading from Malcolm Lowry's autobiographical novel Under The Volcano, which told of the English writers descent into alcohol fuelled oblivion, while distorted guitar flail in prog rock fashion. The opener captures the homespun, idiosyncratic vision of Andy Sharp, found on numerous short-run CDs and vinyl releases. It's a sombre beginning to The Underworld Service, when compared to the following 'River Of Black Rams' Blood' where English Heretic rock out spectacularly in space rock fashion with snatches of dialogue from the Greek based horror film Land of the Minotaur with vocals from Andy Sharp which, as the accompanying recording notes point out, are pitched somewhere between Alan Vega or Andrew Eldritch. To my ears it's resolutely more Sisters of Mercy than Suicide, but that's really unimportant. Things slow down on what English Heretic call the "Philosophical Stoner rock" of 'The Pherenike' where amidst wailing and wooshing synths, soaring guitar lines and slow riffing guitars, Andy Sharp ruminates on severed heads (not, of course, the industrial band) drawing connections between a statue of St Peter located within the church at St Etheldreda, Chancery Lane, London with the trophy skull adornment by US soldiers during the Vietnam War. It's a theme which English Heretic return to later on with devastating results. As unlikely as unexpected, English Heretic plunder the Fleetwood Mac instrumental hit 'Albatross' for 'Peregrine' switching the focus from seabirds to falcons, carrying slide guitar and Peter Green's waves of ambient guitar lacing it with a foreign voice-over and Andy Sharp's spoken reading of J.A. Baker's shamanic nature book of poetic prose, The Peregrine - the key text for the scientific blogger, the Haunted Shoreline, who plumbed the depths of his Sussex location, mixing occult beachcombing with surrealist psychoanalysis. 'The Alchemist of Saltdean', expands on the influence of Bakers book, featuring snippets of an interview with the Haunted Shoreline over downbeat electronic rhythms and heavenly choirs. It helps to join the dots between reference points for English Heretic, but its brief appearance merely acts as a cursory introduction to the Haunted Shoreline's "alchemico-surrealist beachcombing". 'The Alchemist of Saltdean' isn't the only track on The Underworld Service where English Heretic uncharacteristically toy with downbeat rhythms but it is used most chillingly on 'Invisible Canon'. Woven around sounds taken from Threads, an unflinching television serial dramatisation of nuclear war, combined with samples about "skeletons and skulls", and chattering cicadas recorded at Hiroshima, along with the plaintive female voice from Genuine Brandish snatched from their collection Tokyo's Burning, which here amidst the death fixated sounds of The Underworld Service is reminiscent of an apocalyptic singer songwriter, witnessing a scene of devastation where "everything looks strange to me, the world was crushed as far as I could see" over sombre piano chords and wistful flute melody. And as the last words of 'Invisible Canon' ebb out she recounts the fallout in the tellingly bleak lines "and a black rain fell, a cold black rain" finishing what is certainly one of English Heretic's most haunting, evocative and finest tracks. English Heretic draw parallels with the folk horror of the trinity of films comprising The Wicker Man, Witchfinder General and Blood On Satan's Claw on 'Let Sleeping Corpses Lie', a traditional Derbyshire murder ballad about the Winnats Pass killings, here sung by English Heretic's Derby born Hannah Gilbert over droning strings embellished by gurgling death rattle from the film of the same name (perhaps better known as Living Dead at the Manchester Morgue), a pivotal film motif in The Underworld Service exemplified on the following 'Video Anxieties'. Here samples from the Spanish Italian zombie horror film (at least, I think it is) are cleverly interspersed between passages of violin and flute, low brooding bass and soaring guitar flourishes alongside readings of sexual magick workings concerning the creation of zombies taken from Nightside of Eden by Kenneth Grant - whose writings remain a constant influence on the work of English Heretic, with the voice of Andy Sharp narrating an imaginary travel guide mapping an association between death cults, occultism and video nasty zombies. I've always been moved by the way English Heretic draw inferences from locations. I'm fortunate that having relations living in Suffolk I've acquainted myself with some of their Black Plaque commemorative sites and significant points of English Heretic's home turf such as Orford Ness and Sizewell B, and - which all play a role on The Underworld Service - as well as Dunwich, and Ipswich Crematorium where the ashes of Witchfinder General director Michael Reeves were scattered. It's, however, 'Transmutation At Sizewell B' which marries downbeat ambience to English Heretic's own stomping ground, which almost acts as a portal to themes of previous English Heretic releases. Revolving around the mysterious alchemist Fulcanelli's eschatological writings on death, the opening spoken female voice channel Fulcanelli's words about a seal indicating "destruction and annihilation", while Andy Sharp's cold, pensive tones paraphrase Fulcanelli's ponderings on "the age of iron", while ghost choirs hover, synths arch and blur, as a simulated Geiger counter plays against a simple downtempo chill-out rhythm. Drenching Andy Sharp's spoken tones in violin and plucked strings, English Heretic move into Coil-like "Moon Musick" realms on 'Operation Wandering Soul' before slipping into apocalyptic territory using voice-over footage from a 1970 UK TV documentary and sound sources of machine-gun fire and haunting fear filled tapes exploring the techniques used by US forces to terrorise the Vietnamese people, described in the accompanying booklet by Sharp as "pure ritual ambience of the most disturbing kind - ceremonial military industrial aesthetics of the darkest order". And while Coil basked in the invigorating glow of the Golden Triangle, which proliferated towards the end of the Vietnam War, English Heretic seek out the darkness at the heart of the war in this bleak and horrifying track. Closing on the funereal death disco of the title track, it moves from an extended segment of film samples into warped shimmering keyboards and pulsating electro rhythms. This is English Heretic coming close to the retro evocations found on the Ghost Box label, with a voice intoning "we are dying", a constant reminder that death is always close to hand.